A high point on the distant eastern rim of Endeavour Crater is visible on the horizon in this image taken by the panoramic camera (Pancam) on NASA's Mars Exploration Rover Opportunity on March 8, 2009, during the 1,821st Martian day, or sol, of the rover's mission on Mars. 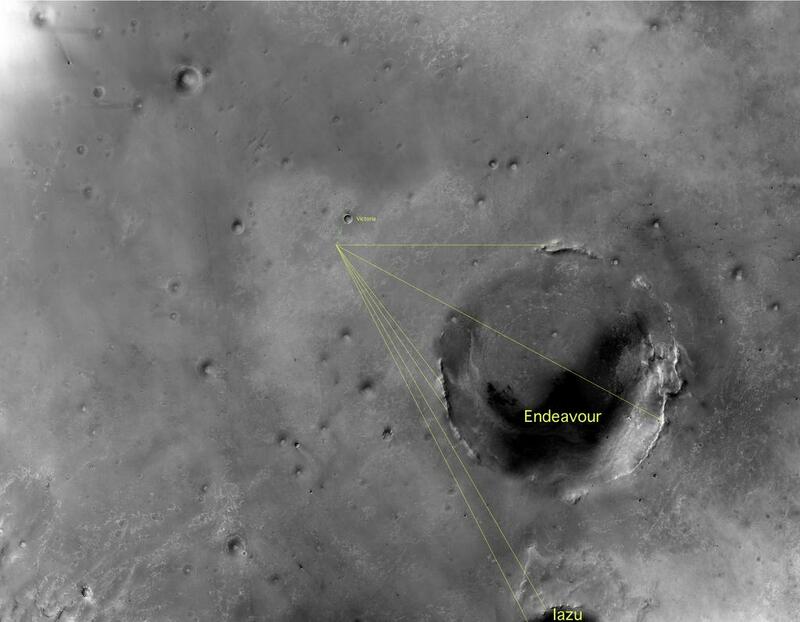 That portion of Endeavour's rim is about 34 kilometers (21 miles) away from Opportunity's position west of the crater when the image was taken. The width of the image covers approximately one degree of the horizon. In the left half of this view from the panoramic camera (Pancam) of NASA's Mars Exploration Rover Opportunity, a western portion of the rim of Endeavour Crater is visible on the horizon. In the right half, the rim of a smaller crater, farther away, appears faintly on the horizon. Opportunity's Pancam took this image on March 8, 2009, during the 1,821st Martian day, or sol, of the rover's mission on Mars. The width of the image covers approximately one degree of the horizon. The part of Endeavour's rim visible here is about 16 kilometers (10 miles) from where Opportunity was when the image was taken. The rover was at the same location as when its Pancam took images after a drive on Sol 1820. Opportunity remained at that location until a drive on Sol 1823. The more-distant rim to the right, part of Iazu Crater, is about 38 kilometers (24 miles) away. Iazu is south of Endeavour and about 7 kilometers (4 miles) in diameter.